Northeast Flooring Solutions is a concrete floor-finishing contractor skilled in all concrete finishes. Those finishes range from sealed concrete which is more of an industrial application finish all the way to a highly decorative polished concrete system. Polished and stained concrete flooring is a fashionable yet economical flooring design statement. It combines the luxurious appeal of high-end stone with the durability of concrete, for an easy to maintain floor with mirror like shine. 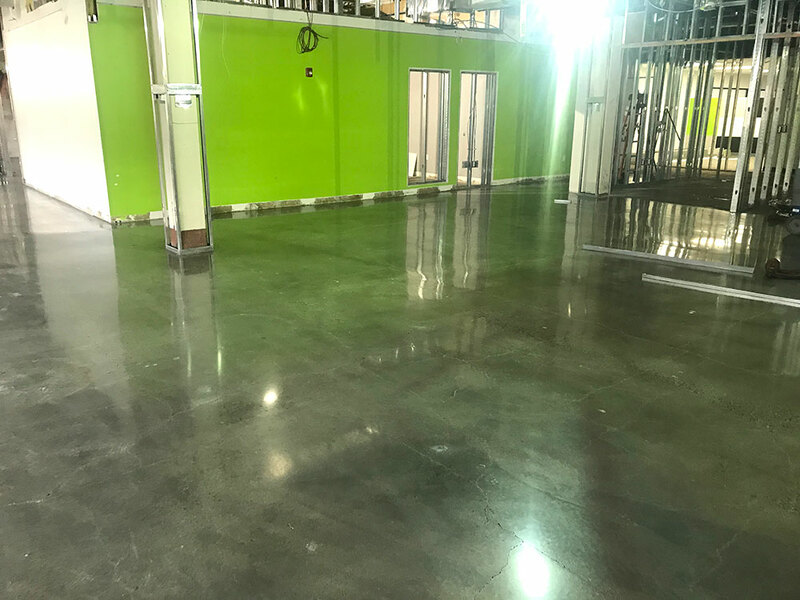 With a wide assortment of concrete stain colors to choose from, and multiple levels of potential polished sheen, your stained and polished concrete flooring is sure to stand out. It contains no volatile organic compounds (VOCs) so is an environmentally friendly option that is tough enough to withstand anything from foot traffic to forklift trucks. Our experienced team moves through a multi-step process of concrete floor preparation, diamond grinding, staining, polishing, sealing and burnishing to achieve your desired outcome. The condition of the concrete will determine the grit of the diamonds we use for the first couple of cuts. Once we get through 80 grit diamonds the cutting stage continues with 100 & 200 grit resins. If the floor is to receive a decorative stain that will be applied after the 200 grit resin pass and then the floor will be densified. Continue polishing with increasingly higher grits (400, 800, 1500) to the desired level of finish. Once we achieve the level of sheen that is expected the floor will be sealed and high speed burnished. The sealer we typically use is Polish Guard by Prosoco. Once dry it is high speed burnished with either a hogs hair or diamond pad. The sealer must be heated to a minimum of 91°F in order to cure the sealer into the slab. Not only will this step help protect the slab but it will add another level of sheen to the polished concrete floor. Northeast Flooring Solutions uses Consolideck sustainable flooring products by Prosoco for all our concrete floor cleaning, staining and polishing projects unless otherwise specified. We also use HEPA filtration vacuum systems which collect 98% of all airborne particles, minimizing dust, cleanup and disposal. At times, concrete-flooring surfaces may need a higher level of service such as our flooring removal to remove old flooring, self-leveling and adhesives.